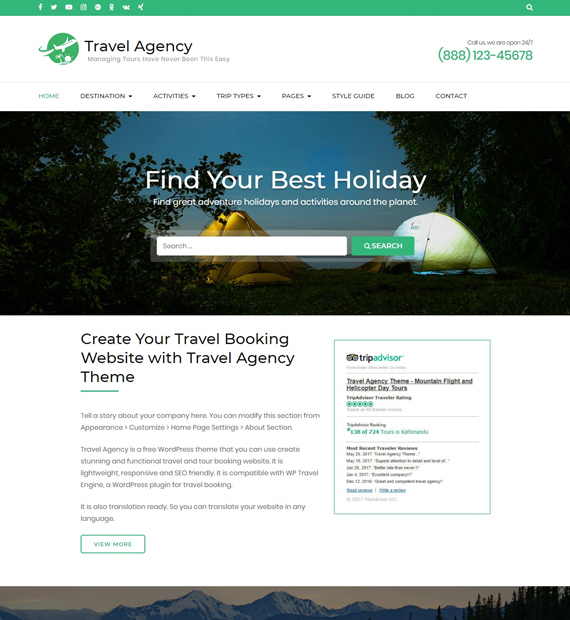 Travel Agency is a responsive free WordPress theme created for travel and tour companies so that they can quickly create an advanced travel booking website without writing a single line of code. You can add trips, destinations, trip types, feature travel activities, highlight your specialties, and allow visitors to book the trips right from your website. The theme is fully compatible with popular travel plugins like WP Travel Engine. You also get free one click demo import with Travel Agency. You also get a responsive design in this theme with a mobile friendly layout. So, you cna use it on any devices of any screen sizes.